Instantly paste plain or formatted text into fields of any program you define. 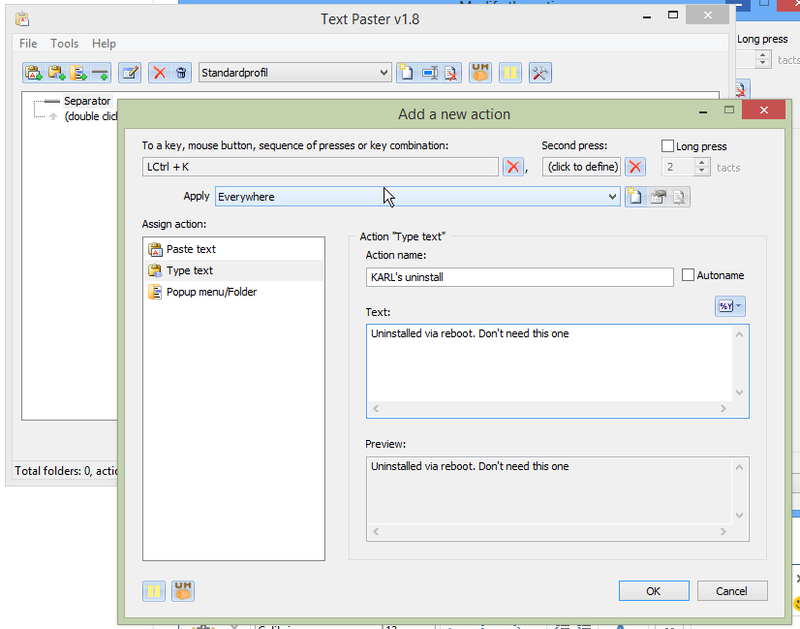 Text Paster 1.8 was available as a giveaway on July 15, 2015! Instantly paste plain or formatted text into fields of any program you define. Input standard phrases, greetings, generic replies, current date and time, letter and document templates, e-mail and website addresses, usernames, passwords, selected text fragments etc. Paste text from a popup menu or press a hot key. Please note: The software includes a 1-year license. After one year you can update it to the paid version or uninstall it. How would you improve Text Paster 1.8? ATNSOFT Calculator is a calculator for everyday use for Android devices. The program lets you instantly enter numbers and expressions using an ergonomic on-screen keyboard and voice input! Execute two or more operations at once with the ability to switch editing screens with a horizontal swipe along the top. All previously executed calculations can be viewed in the operations history. I set up a few fields for form filling under the typing function such as address, phone number, user names for various social media, etc. I used the typing function to fill out those fields in Chrome, Firefox, Abiword, and an older unsupported version of Evernote. It seemed to work fine at 'typing' out the words. There are a couple things that I don't like because they make the program less efficient. It seemed to disable copying anything else while the program is running. I tried multiple times to copy/paste items from web pages and word processing programs and it wouldn't work until I used the pause button to pause the program. Using the pause button required bringing the program to the forefront and actually pressing a pause button, and then pressing it again when I wanted the Text Paster program to function again. Very inefficient. If there's a quicker way to pause the program, I haven't figured it out. Also when I first set up my fields, I simply used the first two letters of whatever I wanted to type. For instance, I used the letters S and A for my email address. Well, apparently it's not that simple because the program disables the first letter for use in any other typing. I couldn't type in the letter 'S' at all for any other word in any other program I tried until I paused the program. I had to go back and add another key (I changed it to Ctrl+S, +A) Not the worst thing that's ever happened to me in my life but still it makes it just a bit more inefficient. While there is a link within the program to go to online help, it really only leads to the product page and there doesn't really seem to be any instructions for the couple of things that are unfamiliar to me and that I'm unable to figure out. I didn't try out the folder menu option too much. It's something that I think just depends on how many items are set up in the program. I only plan to use it for a few basic form filling functions so I don't need to group these things into folders. I also set up my email address in the 'paste' option to see how it performed compared to the 'type' option. (I used Alt+S, +A) The paste appeared to me to act exactly the same way as the typing option. With the typing option, it appeared to actually type the words into the field, but it also appeared to 'type' for the 'paste' option. The word didn't appeared instantanteously like when I usually paste something. That makes it seem as if there really isn't any difference between the two options. My use of this program is hopefully to make all fields appear to have been manually keystroked into the form by my hands. So having to pause the program because it disables things on my computer is annoying and for sure I wouldnt' keep it after the year even if I was possessed to spend that much money on something like this for the simple tasks that I do. I did see on the website that there was a 'pay by trial' option, so over the next year I guess I'll see how indispensable this program proves to be. I set up a few fields for form filling under the typing function such as address, phone number, user names for various social media, etc. I used the typing function to fill out those fields in Chrome, Firefox, Abiword, and an older unsupported version of Evernote. It seemed to work fine at 'typing' out the words. There are a couple things that I don't like because they make the program less efficient. It seemed to disable copying anything else while the program is running. I tried multiple times to copy/paste items from web pages and word processing programs and it wouldn't work until I used the pause button to pause the program. Using the pause button required bringing the program to the forefront and actually pressing a pause button, and then pressing it again when I wanted the Text Paster program to function again. Very inefficient. If there's a quicker way to pause the program, I haven't figured it out. Also when I first set up my fields, I simply used the first two letters of whatever I wanted to type. For instance, I used the letters S and A for my email address. Well, apparently it's not that simple because the program disables the first letter for use in any other typing. I couldn't type in the letter 'S' at all for any other word in any other program I tried until I paused the program. I had to go back and add another key (I changed it to Ctrl+S, +A) Not the worst thing that's ever happened to me in my life but still it makes it just a bit more inefficient. While there is a link within the program to go to online help, it really only leads to the product page and there doesn't really seem to be any instructions for the couple of things that are unfamiliar to me and that I'm unable to figure out. I didn't try out the folder menu option too much. It's something that I think just depends on how many items are set up in the program. I only plan to use it for a few basic form filling functions so I don't need to group these things into folders. I also set up my email address in the 'paste' option to see how it performed compared to the 'type' option. (I used Alt+S, +A) The paste appeared to me to act exactly the same way as the typing option. With the typing option, it appeared to actually type the words into the field, but it also appeared to 'type' for the 'paste' option. The word didn't appeared instantanteously like when I usually paste something. That makes it seem as if there really isn't any difference between the two options. My use of this program is hopefully to make all fields appear to have been manually keystroked into the form by my hands. So having to pause the program because it disables things on my computer is annoying and for sure I wouldnt' keep it after the year even if I was possessed to spend that much money on something like this for the simple tasks that I do. I did see on the website that there was a 'pay by trial' option, so over the next year I guess I'll see how indispensable this program proves to be. I want to use this program for the typing function as I sometimes fill out forms that one isn't supposed to use form fillers or any other programmed or robotic script with. Sometimes a form might even state to use manual keystrokes only. I'm hoping and figuring that the typing function of this program will make it appear as if I'm actually manually typing into the fields with my own two hands. Does anyone know if the online forms can be set up to recognize that I'm using this program to 'type' information into the fields? Always found Typer Task to be one of the best: http://www.portablefreeware.com/?id=1854 and it's compltely free & portable. Always found Typer Task to be one of the best: http://www.portablefreeware.com/?id=1854 and it's compltely free &amp; portable. Easily installed on Win 7, but very hard to figure out how to use it. Pressing Help/online still didn't offer instructions. I did get it working and HOORAY! Lovely program. My eddress with @ is 16 characters long! Now it's my 2-key code! Thank you. 2. You may use this software during the evaluation period of 1 year (Giveaway of the Day version). If you want to use the program further on, you MUST download and install the regular version and register your copy of the program. 3. After the registration, the user may use Text Paster for any legal purposes on the number of computers and under the conditions stated in the purchased license. 2. You may use this software during the evaluation period of 30 days. If you want to use the program further on, you MUST register your copy of the program. I can find nothing that says that a paid license is time-limited. This (regular, not GOTD) license also states, in the section SOFTWARE UPDATE: "All updates are free for registered users." Let the debate over update vs upgrade commence. Typically, the EULA is presented early in the setup procedure; you can quit after reading it. It would be nice, though, if it were available through a link on the developer's website. The EULA presented during install of the GOTD build states: 2. You may use this software during the evaluation period of 1 year (Giveaway of the Day version). If you want to use the program further on, you MUST download and install the regular version and register your copy of the program. 3. After the registration, the user may use Text Paster for any legal purposes on the number of computers and under the conditions stated in the purchased license. Install the software downloaded from atnsoft.com and the EULA states: 2. You may use this software during the evaluation period of 30 days. If you want to use the program further on, you MUST register your copy of the program. 3. After the registration, the user may use Text Paster for any legal purposes on the number of computers and under the conditions stated in the purchased license. I can find nothing that says that a paid license is time-limited. This (regular, not GOTD) license also states, in the section SOFTWARE UPDATE: "All updates are free for registered users." Let the debate over update vs upgrade commence. Typically, the EULA is presented early in the setup procedure; you can quit after reading it. It would be nice, though, if it were available through a link on the developer's website. Some issues with hot keys: (1) remembering (i.e. learning) the shortcuts (2) not enough key combinations available, or complexity (3) new software use shortcut already taken (n) etc. I'm not sure that popping up a menu with a tree is the right solution either. You have to leave the keyboard, grab the mouse, scroll through a (long) list, select the words, paste, and back to the keyboard. Not very healthy moves. For frequent sentences such as "Best regards", either you learn fast typing or have templates for letters, emails... For less frequent words, perhaps you don't remember you haven't stored them yet... If you like templates, you might like Leo too (sourceforge.net/projects/leo/). Autocompletion solves some of the issues, mainly the memory problem, and add productivity. Try PhraseExpress, PhraseExpander or WordExpander (free alternative to PhraseExpander). Some issues with hot keys: (1) remembering (i.e. learning) the shortcuts (2) not enough key combinations available, or complexity (3) new software use shortcut already taken (n) etc. I'm not sure that popping up a menu with a tree is the right solution either. You have to leave the keyboard, grab the mouse, scroll through a (long) list, select the words, paste, and back to the keyboard. Not very healthy moves. For frequent sentences such as "Best regards", either you learn fast typing or have templates for letters, emails... For less frequent words, perhaps you don't remember you haven't stored them yet... If you like templates, you might like Leo too (sourceforge.net/projects/leo/). Autocompletion solves some of the issues, mainly the memory problem, and add productivity. Try PhraseExpress, PhraseExpander or WordExpander (free alternative to PhraseExpander). which can copy blocks of text as whatever-it-is, as plain text, or HTML. Of course, that is limited to things you may visit with the browser, but that is 95 % of where I need it, in any case. If today's program also includes some macro-recorder / playback features -- something I have not really needed -- there are some well-regarded apps around for that. Anyway, a quick skim of today's giveaway description suggests to me that the main functionality of this that might otherwise be of interest to me for most purposes is already covered by a FireFox addon that I've been using for a long time https://addons.mozilla.org/en-US/firefox/addon/extended-copy-menu-fix-vers/reviews/?src=api which can copy blocks of text as whatever-it-is, as plain text, or HTML. Of course, that is limited to things you may visit with the browser, but that is 95 % of where I need it, in any case. If today's program also includes some macro-recorder / playback features -- something I have not really needed -- there are some well-regarded apps around for that. @Gene, remember that many of us want these utilities to operate outside the Firefox environment, on any (or at least most) Windows applications. I had no trouble getting the program to type my name with Ctrl-N (Win7-64) but could not figure out how to use pop-up menu. Help is not help, it just repeats program features. The screenshots left me baffled! It would take a year of trial-and-error to learn how to use this program. I set my clock for Aug, 2016 and received a "Clock Manipulation" error and program did not start. Switched back to current date and program did start. Considering the lack of help, learning curve and time limit, I call this software Wasteoftheday. $24.95 for a license. LOL I wouldn't pay 24 cents. Uninstalled. To figure out how to use pop-up menu, I examined the first of five screenshots. Then I work alone, to reproduce identically. Once understood, we use a single shortcut (F12 by example) to select our choice from the set of datas that are availables. This avoids the need to define a shortcut for each of usefull datas. Availability of separations lines also allow visual subgroups. In the "Popup menu/Folder" windows don't forget to click on the "Add an exception"
In the "Paste text" and "Type text" windows don't forget to click on the "Insert text template"
In any windows, don't forget to click on the right button mouse for an avalaible sub menu. To figure out how to use pop-up menu, I examined the first of five screenshots. Then I work alone, to reproduce identically. Once understood, we use a single shortcut (F12 by example) to select our choice from the set of datas that are availables. This avoids the need to define a shortcut for each of usefull datas. Availability of separations lines also allow visual subgroups. In the "Popup menu/Folder" windows don't forget to click on the "Add an exception" In the "Paste text" and "Type text" windows don't forget to click on the "Insert text template" In any windows, don't forget to click on the right button mouse for an avalaible sub menu. A usefull program, but without user manual or video tutorial. Only five screenshots. Why don't offer few free import setting files? Like the profiles files used for the five screenshots. A question: why the both keys "Press Shift" and "Release Shift" or "Press Ctrl and Release Ctrl" are availables. Is the key "Press Shift" must necessarily be followed by the key "Release Shift" ? And how to insert the action "Ctrl A" to Select All, by example. A usefull program, but without user manual or video tutorial. Only five screenshots. Why don't offer few free import setting files? Like the profiles files used for the five screenshots. A question: why the both keys "Press Shift" and "Release Shift" or "Press Ctrl and Release Ctrl" are availables. Is the key "Press Shift" must necessarily be followed by the key "Release Shift" ? And how to insert the action "Ctrl A" to Select All, by example. Thanks by advance. Why does everyone get so uppity over a 1 year license? Would you disdain the free use of a car for 1 year? you won't accept free rent for one year because you will have to pay rent come the new year? You're asking someone - who works creating computer utilities - who also made you a decent offer - (for one years free use of his product) - to work for you for nothing for the rest of your life. Turn it around - what are you willing to offer everyone else FREE for a year? Why does everyone get so uppity over a 1 year license? Would you disdain the free use of a car for 1 year? How about rent? you won't accept free rent for one year because you will have to pay rent come the new year? You're asking someone - who works creating computer utilities - who also made you a decent offer - (for one years free use of his product) - to work for you for nothing for the rest of your life. Turn it around - what are you willing to offer everyone else FREE for a year? I think you are making some errors: a computerprogram is not comparable to a car. A car has use in itself, like a computer with installed programs has use in itself. A computerprogram has no use in itself without a computer to run it on, it adds functionality to something you own. To remain in your comparison to an automobile: it is like you have bought a car, and the carsalesman asks you to buy the ashtray (added functionality) on a 1 year license. (with more complex programs some arguments for a 1 year license could be made but this program is almost as simple as an ashtray). Also, you don't ask someone to work for you the rest of your life (when you don't get into a licensing system), you buy something they have allready created, like a company that has produced the ashtray. (Gotd's usually do not include updates). The life expectancy of modern software is usually short; new versions e.g from version 6.x to 7.x (not updates e.g. 6.0 to 6.1) appear rapidly and you have to buy those new versions time and time again (often the programmer dit not make the new version of the program from scratch, they adapted the old version e.g to fix compatbility issues, add new functions, etc.). Software licensing is usually introduced because marketeers connected to softwarehouses think that they can get more money out of existing code; the center of that "thinkmodel" is not the user (like it should be) or improving the product (by creating new versions) anymore: no wonder why lots of people don't like it: the stimulant for softwarecompanies to produce better products is gone. I think you are making some errors: a computerprogram is not comparable to a car. A car has use in itself, like a computer with installed programs has use in itself. A computerprogram has no use in itself without a computer to run it on, it adds functionality to something you own. To remain in your comparison to an automobile: it is like you have bought a car, and the carsalesman asks you to buy the ashtray (added functionality) on a 1 year license. (with more complex programs some arguments for a 1 year license could be made but this program is almost as simple as an ashtray). Also, you don't ask someone to work for you the rest of your life (when you don't get into a licensing system), you buy something they have allready created, like a company that has produced the ashtray. (Gotd's usually do not include updates). The life expectancy of modern software is usually short; new versions e.g from version 6.x to 7.x (not updates e.g. 6.0 to 6.1) appear rapidly and you have to buy those new versions time and time again (often the programmer dit not make the new version of the program from scratch, they adapted the old version e.g to fix compatbility issues, add new functions, etc.). Software licensing is usually introduced because marketeers connected to softwarehouses think that they can get more money out of existing code; the center of that "thinkmodel" is not the user (like it should be) or improving the product (by creating new versions) anymore: no wonder why lots of people don't like it: the stimulant for softwarecompanies to produce better products is gone. Pluto - regardless - My thoughts and feelings are just that - MY thoughts and feelings. They're not voiced as a challenge for anyone to try change my mind. If you don't want the program - don't take it. But to refuse it solely because it isn't free for life? sounds at the least - misguided. Pluto - regardless - My thoughts and feelings are just that - MY thoughts and feelings. They're not voiced as a challenge for anyone to try change my mind. If you don't want the program - don't take it. But to refuse it solely because it isn't free for life? sounds at the least - misguided. Why do all the links posted [except for imgur.com] not go where they should? When I click other links, I am instead taken to some strange sur.ly website that seems untrustworthy to me. Not being able to follow the links does not enable me to compare what is said with the posted software. Has Giveaway of the Day been hacked? Why do all the links posted [except for imgur.com] not go where they should? When I click other links, I am instead taken to some strange sur.ly website that seems untrustworthy to me. Not being able to follow the links does not enable me to compare what is said with the posted software. Has Giveaway of the Day been hacked? Go to your sur.ly web page and read up on the programs that you use. RTM before you claim a web page is hacked. nomadass1: I just asked if this page had been hacked because the links took me somewhere other than what they showed. That is OBVIOUSLY different from claiming a page was hacked. Please read what people post more closely. I have no intention of reading anything on sur.ly -- the way the page comes up and how it displays to me give me no reason to trust it or want to do anything other than get away from it. My multiple layers of integrated proactive security coupled with periodic in-depth scans give me reasonable confidence that there are no problems on my computer so do not be concerned. nomadass1: I just asked if this page had been hacked because the links took me somewhere other than what they showed. That is OBVIOUSLY different from claiming a page was hacked. Please read what people post more closely. I have no intention of reading anything on sur.ly -- the way the page comes up and how it displays to me give me no reason to trust it or want to do anything other than get away from it. My multiple layers of integrated proactive security coupled with periodic in-depth scans give me reasonable confidence that there are no problems on my computer so do not be concerned. 1) A 1-year licence. This is not complex software like Adobe Creative Suite or Autocad. This is a very simple software; the genre of which include many powerful freeware alternatives. It is bad enough if you ask people to pay once to buy the software. It is intolerable if you ask them to pay EVERY YEAR. 2) How can you expect users to remember numerous key sequences? Karl's comment "If you can remember dozens of preset keys, than this could be the right program for you." 3) Ditto is infinitely superior to this. Ditto is portable and free. Big mistakes in the software: 1) A 1-year licence. This is not complex software like Adobe Creative Suite or Autocad. 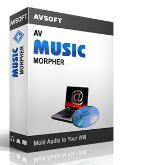 This is a very simple software; the genre of which include many powerful freeware alternatives. It is bad enough if you ask people to pay once to buy the software. It is intolerable if you ask them to pay EVERY YEAR. 2) How can you expect users to remember numerous key sequences? Must be crazy. Karl's comment "If you can remember dozens of preset keys, than this could be the right program for you." 3) Ditto is infinitely superior to this. Ditto is portable and free. "One year" seem to be all the rage these days. why would a one year trial be satisfactory? It is not. I pass on all such deceptive software. (general unreasonable overpriced companies with no support). Subscription software should be avoided/rejected always. I have installed this but it won't run. Windows 7 64 bit. Any ideas? Same problem here. I could have really used this to. I do a lot of work with BB code, and this was looking like a time saver. Excellent service and a very good program. Try to launch the installer as Administrator. I'm using Flashpaste (another give away here) on Win 7 / 64 bit. Works fine. Same problem here. What's the solution? ... my question is: what is this tool capable of, what "Autohotkey" ( especially in form of the elaborated set nmed "ac'tivAid" ! ) would not do for you for free, without limitations an capable of much, much more? beside that they claim <i>"The software includes a 1-year license. "</i> which for me still is unclear: do they mean 1 year free updates (hope so), or will it end to work? :-( ... my question is: what is this tool capable of, what "Autohotkey" ( especially in form of the elaborated set nmed "ac'tivAid" ! ) would not do for you for free, without limitations an capable of much, much more? All clipboard formats are supported. Pop-up menu is displayed by "Alt+C." Picture is displayed on a menu. Tool tip is displayed on a menu. The format to leave and the format to save can be set up. The ignored window can be set up. The paste key for every window can be set up. Function is extensible with plug-in. Hope you will like it. CLCL is on every PC i have ! CLCL is a completely different kind of software. It's just saves a copy of everything you've copied. You can also use Popup menus (see screenshots here). You can also use Popup menus (see screenshots <a href="http://atnsoft.com/textpaster/screenshots/" title="Text Paster Screenshots" rel="nofollow"><strong>here</strong></a>). A (Russian?) company without name and address. The program is on the market since 2009. The first release of Text Paster (version 1.0) is out. " By the way, I like such a version history for several reasons. A resizable interface opens, you can switch the language between Russian, English, German an Portuguese, in the options you can define the timing (delay) behavious and that's it. So far so good, it does what it claims. If you can remember dozens of preset keys, than this could be the right program for you. A nicely made small program for often used text snippets, but with my memory? Installed and registered without problems on a Win 8.1.3 Pro 64 bit system. A (Russian?) company without name and address. The program is on the market since 2009. <i>"1.0 build 64 (November 19, 2009) The first release of Text Paster (version 1.0) is out. </i>" By the way, I like such a version history for several reasons. A resizable interface opens, you can switch the language between Russian, English, German an Portuguese, in the options you can define the timing (delay) behavious and that's it. Before you really can use this, you have to define the behavior, define the keys and the actions: http://i.imgur.com/xJPy402.png So far so good, it does what it claims. If you can remember dozens of preset keys, than this could be the right program for you. I have already forgotten, what way the control-k key. Ahhhh, wait, yes: Uninstalled via reboot, Don't need this one... You have to see, how it is written character after character... A nicely made small program for often used text snippets, but with my memory? Ah but Karl, if you keep the instructions as a note then problem solved. You just need to remember which key combo to get the note back. Problem no more. But you've forgotten to hint that this is only a 1-year-TRIAL. This seems to correspont with the timestamp the software is trying to build. Karl, Danke. But you've forgotten to hint that this is only a 1-year-TRIAL. And on all machines I'm testing this TextPaster ist get a system-warning (Clock manipulation detected! ): http://imgur.com/iMhNvXW This seems to correspont with the timestamp the software is trying to build. On my DOS computer I am using a text editor (PC WRITE) from 1989. It can load a "shorthand" file with "shortcuts" - some words that , once typed, can be replaced with a text. For example , whenever I type "xe " , the editor inserts "$endif". But.... I keep a piece of paper in my eyesight to remember the shortcuts. Obviously those who don't understand just how powerful PC-Write is are marking you down; still have a copy on my XP machine as it has functions not available in any other program. Radu Obviously those who don't understand just how powerful PC-Write is are marking you down; still have a copy on my XP machine as it has functions not available in any other program. Probably PC-Writes greatest power is its find and replace facility which will work in text and BINARY files. Used it on a network traffic database when the supplied converter to Excel was found to give erroneous data. Running DOS programs in Windows 7, good information here:- http://www.pcworld.com/article/243718/run_dos_programs_in_windows_7.html Probably PC-Writes greatest power is its find and replace facility which will work in text and BINARY files. Used it on a network traffic database when the supplied converter to Excel was found to give erroneous data. Anytime I want to get something productive done with computer maintenance I shell out to command line. Wanted a small utility to list the contents of a folder in windows. Don't remember the cost, but went to command line - cd to the folder I wanted to list - dir>filelist.txt /b. Redirects a nice textfile of everything in the folder. (IT helps to be in the folder when you do so, saves a lot of typing from the default folder. the "/b" switch - makes it plain text without all the extraneous info telling you what folder, date & time etc and that it was windows etc. Simple, powerful & useful. Anytime I want to get something productive done with computer maintenance I shell out to command line. Wanted a small utility to list the contents of a folder in windows. Don't remember the cost, but went to command line - cd to the folder I wanted to list - dir&gt;filelist.txt /b. Redirects a nice textfile of everything in the folder. (IT helps to be in the folder when you do so, saves a lot of typing from the default folder. the "/b" switch - makes it plain text without all the extraneous info telling you what folder, date &amp; time etc and that it was windows etc. Simple, powerful &amp; useful. OMG - I thought I was the only one who even KNEW what PCWrite was. Used it all the time until I found qEdit by Semware. Then PEDIT (freeware) by Paul Brand allowed vertical mark and cut. Still looking for more. John, you just reminded me of "drop to DOS" a utility which embeds into the context menu (right click menu) that opens a command shell in the current folder - saves cd'ing to the folder, such a pain! Found at all free software sites.